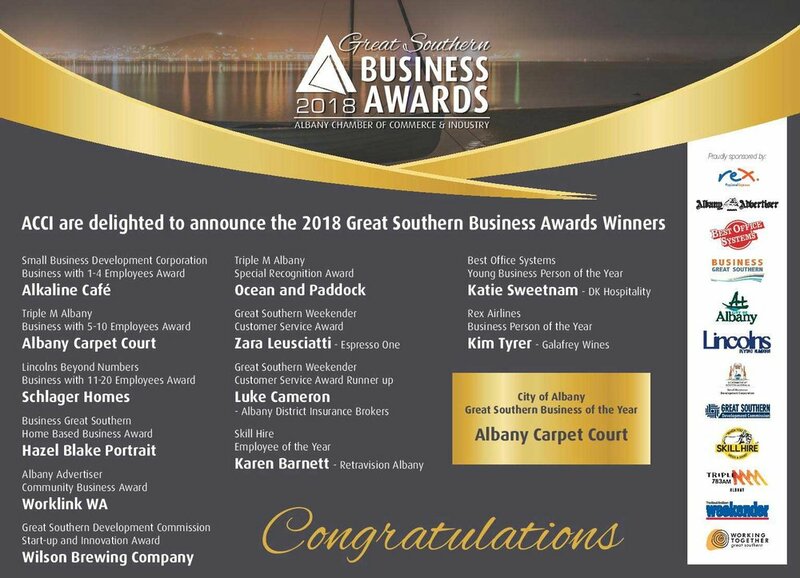 The ACCI Great Southern Business Awards have become the most prestigious event on the Albany business events calendar. The awards put the spotlight on some of the region’s most outstanding businesses and their energy, innovation, passion and success. ACCI’s business awards present an unparalleled opportunity for local businesses to undertake an in-depth review of all aspects of their respective business, and gain significant media exposure for those participating in these prestigious awards provide. Winners receive peer recognition and publicity at a local level and in the ACCI newsletter, plus there is the possibility of receiving coverage at a State level. Preparing an award submission gives business owners a fresh perspective and new insights into future strategies for the growth and development of their business. The awards enable all Businesses to celebrate the quality, diversity and ingenuity of business evident in the Great Southern, and the opportunity to acknowledge peers on their success. Previous award winners have recognised many benefits that flow to their business including team building and motivation to strive for excellence. Nominations for the 2019 Business Awards will open soon mid year.